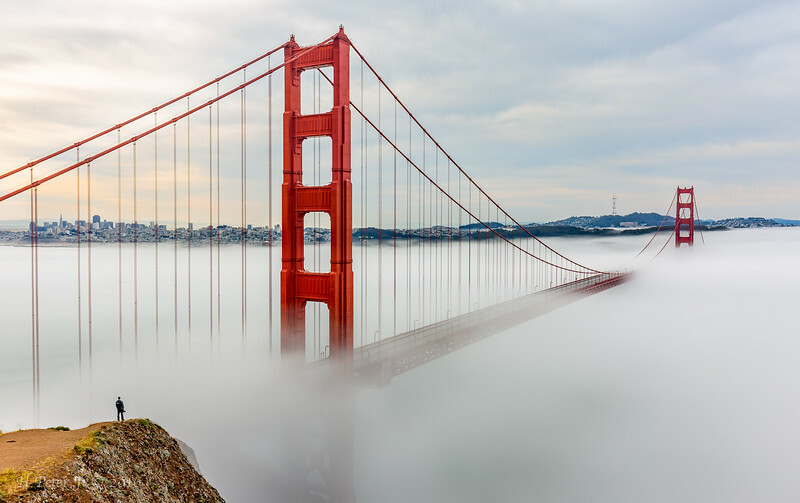 As soon as the sun rose, the marine layer rolled in and engulfed the bridge. Only foghorns echoed relentlessly. 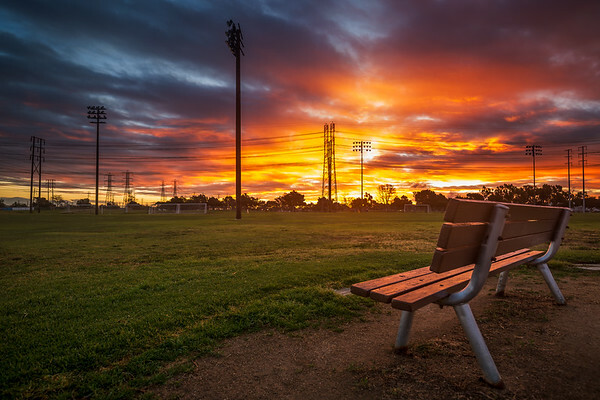 As is often the case, there’s no guarantee in catching the gorgeous sunrise every morning. But not getting up early enough and not being at a spot where a sunrise could be well watched will never help catch one. Just a right amount of clouds lingering right below the horizon makes all the difference. And when that happens, you get rewarded with one of the prettiest sunrises you’ve witnessed. It’s always hit or miss. I’ve counted only a handful of sunrises this February alone, which is ending in a few days already. But not only this sunrise made me feel worth getting up early but also exceeded my expectations. Of course, it is always challenging to frame a shot differently at the same spot over and over. I just hope that the sky painted in gorgeous colors like this is beautiful enough to draw their attention to it. As the clouds that had completely blotted out the sky for most part of the day finally broke, I arrived at the park. I grabbed my camera gear and walked across the soccer field to the opposite side. I wanted to compose a shot of this particular tree and the dirt trail that looked like gliding past beyond the tree. 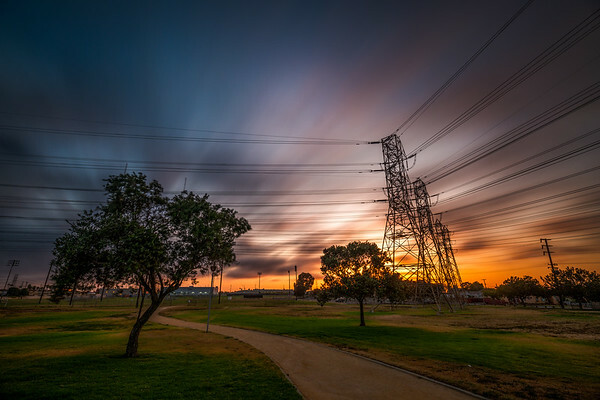 However, to get the composition that I liked, I realized that I actually had to lose the sight of the sun, which was sinking fast behind the power towers. So, I exposed the shot long enough to take advantage of the clouds colorfully stroking the sky soaked in bright orange hue. 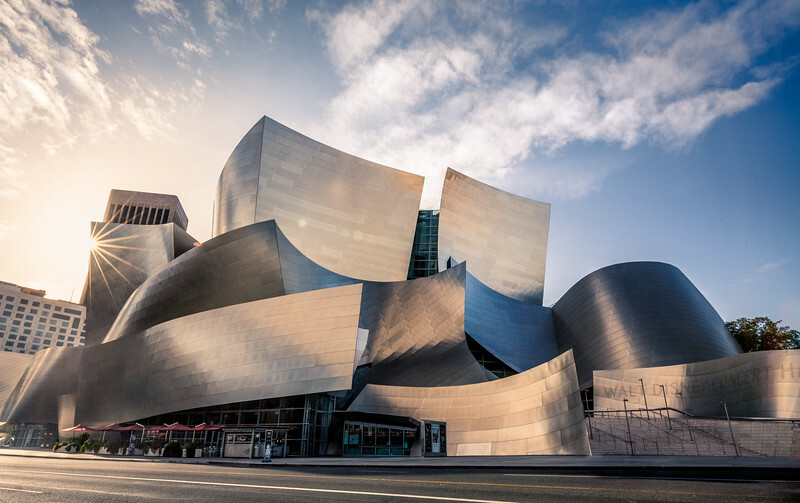 One of Downtown LA landmarks that I wanted to take photographs this time around was the Walt Disney Concert Hall. I’ve taken photos of it a few times, but I was actually doing time lapse, and using multiple exposures, I created a clean, almost deserted look. I removed all the vehicles on the road as well as the pedestrians and turned it into an almost early Sunday morning feel to it. And yet the sun was waning slowly behind this home of the LA Philharmonic Orchestra. It wasn’t a downpour but came down consistently throughout most of the day. Just over an hour or so before the sunset time though, the rain stopped, and I saw one corner of the sky clearing up. 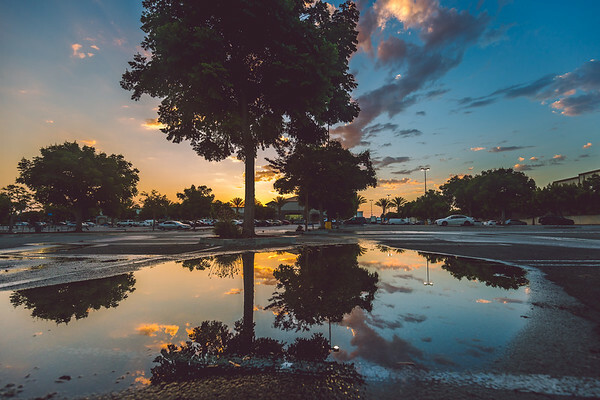 Although most of the sky remained blotted out by the rain clouds, one could always hope for a decent sunset, if not an amazing one. 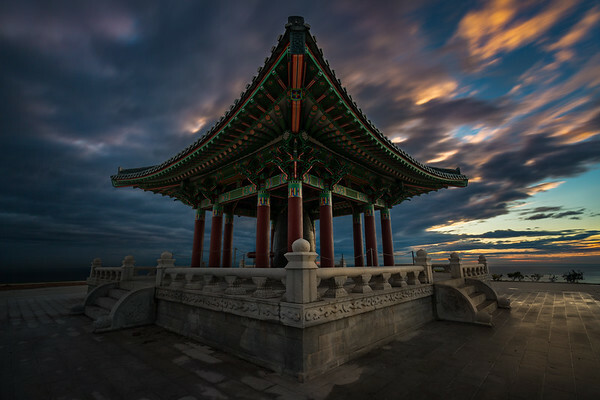 When I arrived at Korean Bell of Friendship, it was quite breezy. And the clouds didn’t give way to the sun. In fact the opening was closing fast and the sunset glow was fading by the second. 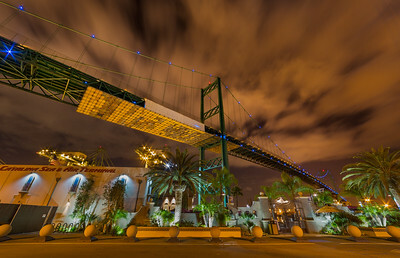 Vincent Thomas Bridge is quite a prominent landmark in San Pedro, California, which connects the port town to the adjacent Terminal Island. Driving over the suspension bridge is as cool as its distinctive green color from a distance. 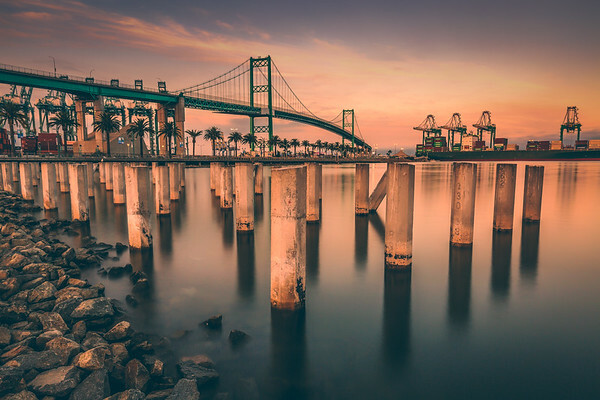 This spot decorated with the cement posts in the water, right by World Cruise Center, is a kind of go to spot where anyone can take great photos of the bridge. I had taken photos here before and they were set at night time. I wanted to capture the sunset glow cast on the bridge as well as on the cement posts. The calm water glowed in orange. And the sporadic clouds slowly took over the pink sky. A gorgeous sunrise doesn’t necessarily requires one to travel far or seek mountains and beaches. But, it definitely requires a puddle of water may work. Maybe some trees. LOL But, all kidding aside, that’s exactly what I found in a park lot of a super store. Maybe all he/she needs is an eye for it. 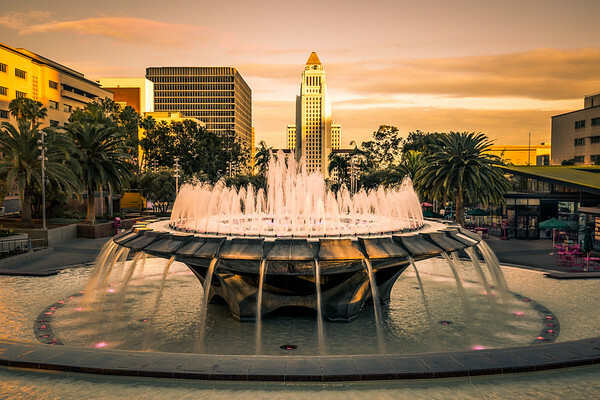 As part of the Downtown LA landmark series, while spending a late afternoon and an evening, I turned to one of my favorite sights - the water fountain at Grand Park with a view of the City Hall. I waited till the sunset glow started hitting the iconic building. Usually the lighting at this pretty water fountain intermittently changes in a few different colors, like blue, red and yellow. But it didn’t change from magenta (or pink) that evening. Then, later as I was packing up, it dawned on me that it stayed magenta because it was Valentine’s Day. 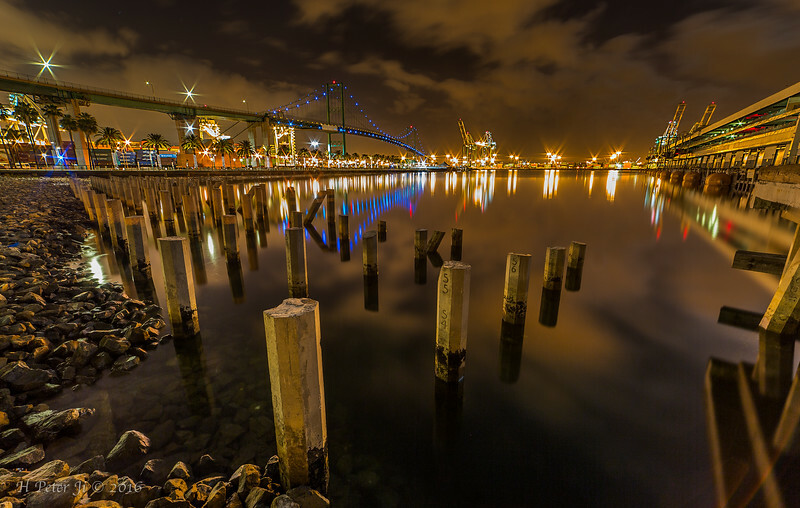 This time of the year two things always occur here in San Pedro, California. First, it gets windy. I mean, extremely windy. Yes, it probably has everything to do with the fact that it is a port/harbor town. The other is that, again, it being a port/harbor town, the thick wall of marine layer out in the ocean forces the sun to set early. I often see Catalina Island disappear under the thick blanket of marine layers. And this evening it was no exception. Once I was settled at a spot where I was able to capture the sun dropping right behind the wall of marine layer, I simply waited. The windchill was dropping fast. And then it was happening. Every corner of the marina was getting flooded by the gorgeous sunset glow. And then I started pressing the shutter button away. When I get up in the morning, the first thing that I do is to check whether or not there are clouds in the sky. And that morning, the sky in the east was blanketed with an ample amount of clouds. 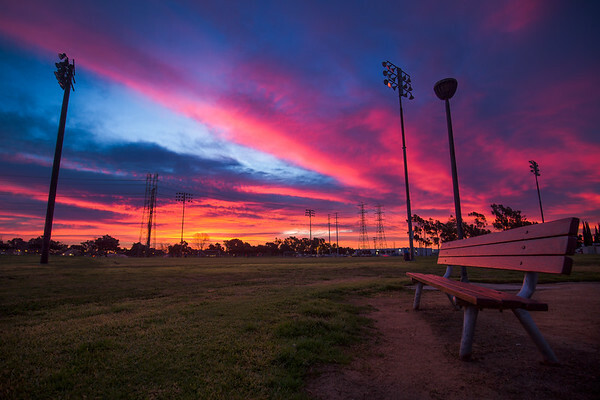 As soon as I saw the pink glow slowly percolating through them, I grabbed my gear and headed over to the park where I go for a run. 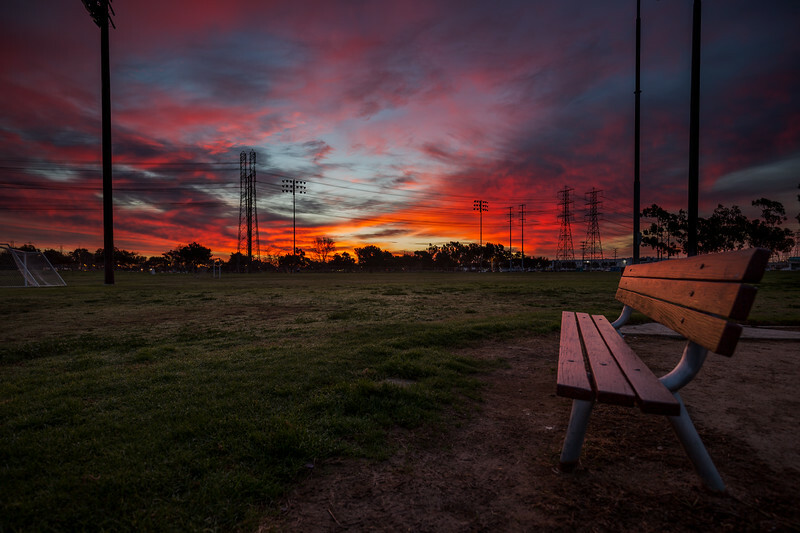 And then I saw the sky starting to catch fire. The marine layer that persisted all day finally gave way to the clear sky that was slowly turning orange. However, it didn’t promise a gorgeous sunset. Instead, it diffused the sunlight like a giant soft box. While it cast a beautiful, soft glow all over the place, my drone shot up high into the sky. A perspective that I had never dreamt of witnessing was unfolding right before my eyes. The whole world was glowing orange as the sun touched the horizon. Southernmost tip of South Bay! 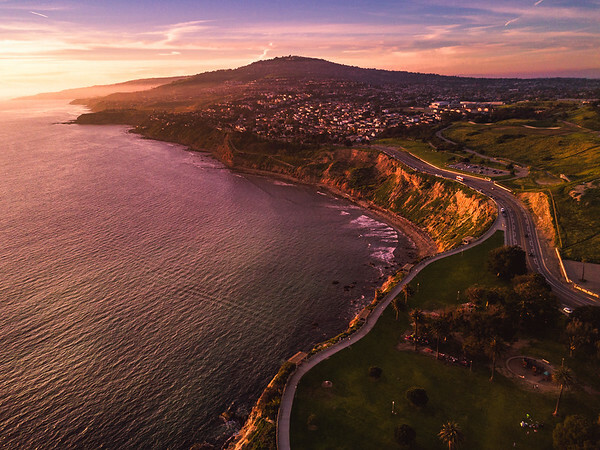 As the drone soared high into the sky, the expansive view of Cabrillo Marina unfolded before my eyes. 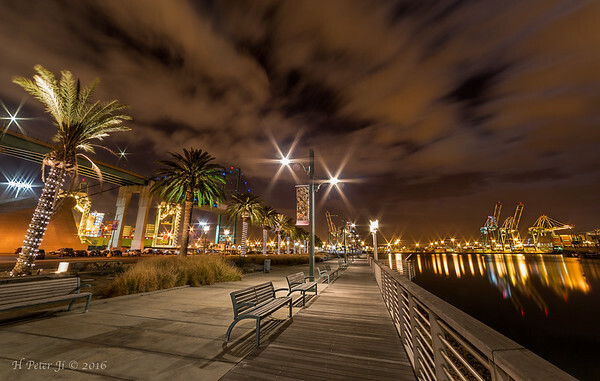 I often go for a run to and around the marina. But even when I run over the bike path, the highest point of the adjacent street park where I look in the direction of the marina, it doesn’t offer a view even remotely close to what I am now able to look through the drone’s tiny 1/2.3” (CMOS) sensor and 28mm lens. 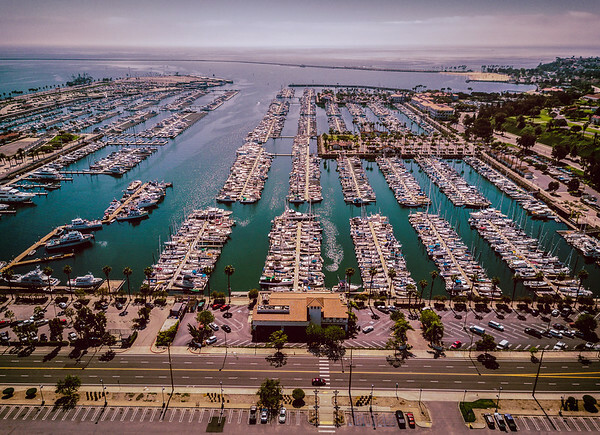 Not only the immediate marinas but also Cabrillo Beach and the pier, as well as the breakwater that stretched far out into the ocean. Welcome to the southernmost tip of South Bay! The brigdge was seen from the corner of the World Cruise Center. 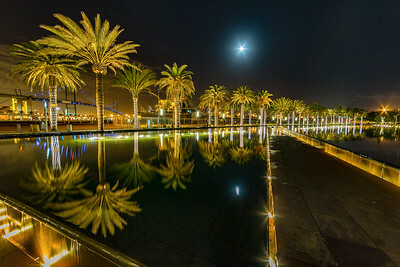 The water was calm, and the night was lovely. The full moon was out. The clouds were scattered. The lights were bouncing. 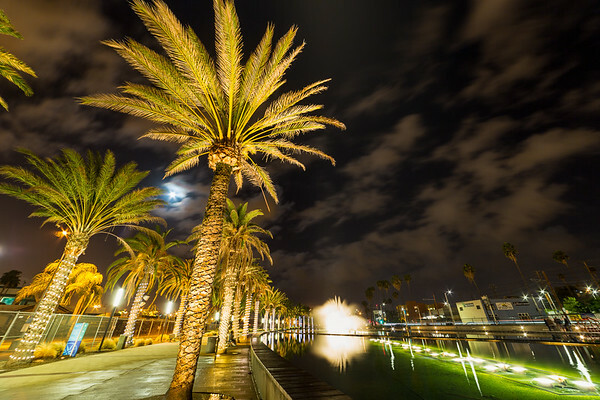 The palm trees were radiating! After finishing time lapse at the Walt Disney Concert Hall, I crossed the street and ended up at the rear of the the Ahmanson Theatre, thinking that I could take shots of dramatic clouds hanging over the mountains in a far distance. Unfortunately there was no clear view. 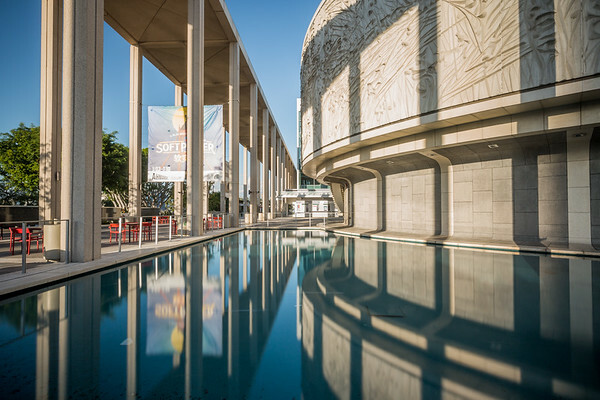 I moved on and soon found myself at the front of the Mark Taper Forum. What caught my eye right away was the geometric shapes of the structure and the shadows cast on the cylinder shaped wall of the hall. I smoothed out the water surface to get a clear reflection. Another year is coming an end. It already has in other parts of the world. How has the year been treating you? Definitely it was an interesting one for me. Life is all about making progress in what you do, pursuing happiness and growing as a person. Wish all of you another amazing year.